Visit Norway will reward a novice photojournalist with a complimentary two-week journey throughout Norway in order to reap the content created, promote the destination and stimulate Norwegian buzz in the social media space. Among the dream job opportunities they’ve given include a guest producer spot with CBS’ NCIS, a writing position on Lance Bass’ Sirius XM radio show, back-up singer for Michael Bolton and others. DreamJobbing is a multi-platform offering that combines online, social and TV production. The Visit Norway promotion is for those “who love photography, travel and adventure.” Applicants must go to http://www.DreamJobbing.com/VisitNorway to apply by uploading a one-minute video and activating their social networks to gain support. They can also share their best photographs on Instagram and use the hashtag #NorwayDreamJob to increase their chances of landing the DreamJob. The winner, who will be dubbed Visit Norway’s Photojournalist, will receive round-trip economy airfare to Norway on Norwegian Airlines, as well as accommodations and activities in the Oslo and Fjord regions and a daily allowance on a two-week journey through some of Norway’s most stunning landscapes this coming summer. For Visit Norway, the promotion provides a way to set a wild fire on social media and generate photography and blogs. For the winning amateur journalist it’s a chance to experience the fjords, waterfalls, mountains and valleys, tasting traditional foods, staying in fine hotels and kayaking, hiking, and glacier walking in the Fjord Norway Region, to exploring historic museums and medieval fortresses in the Oslo Region. Last year, hotel bed nights in Norway declined 3.5 percent to 30.3 million even as hotel revenues climbed 2.7 percent from NOK 12.2 billion in 2013 to NOK 12.5 billion in 2014. 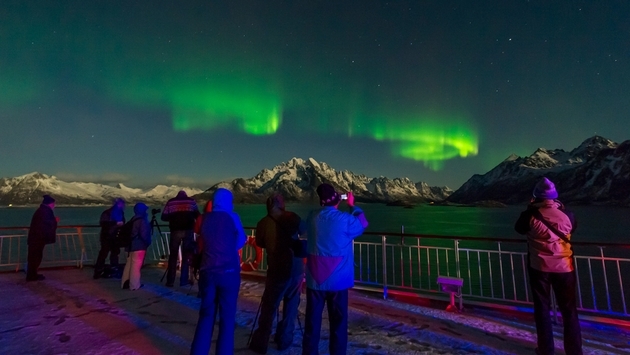 Norway has been enjoying a surge in its tourism thanks to several factors ranging from increased interest in the Northern Lights, the popularity of cruising its coast with Hurtigruten and the continuing popularity of the Disney film Frozen, which premiered in late 2013. The detailing in the Disney film seems to have created a much fuller understanding of what one finds in Norway. Before the film, the fjords dominated that understanding, but now the way people imagine Norway seems much broader. Before creating the film, which was loosely based on Hans Christian Andersen’s The Snow Queen, a team of Disney animators travelled around Norway to create the visual vocabulary of the film’s imaginary kingdom of Arendelle. The fact that Disney highlighted Sami, as well as southern Norwegian, culture in the film added momentum to a growing curiosity among long-haul travel markets to experience the aboriginal cultures of Europe’s far north. It wasn’t too long ago that winter tourism to cold destinations was confined primarily to skiing. That is no longer the case.